2006.11.14 - Long time, no update! So, wow. It’s been what…over a year? How time flies when life is throwing buckets at you. Well, I’m going to start updating this journal with information on the (currently) continuing development efforts of my 4e5 entry entitled Mop of Destiny. No, I haven’t given up on that racing game. Content creation got the better of me, but it’s not a dead project. I figured I had a chance to FINISH a 4e5 entry, so I switched gears a bit. More info to come shortly (tonight). It is now highly apparent that there is no chance of me finishing this project by the end of this month. It was an impressively unrealistic goal in the first place. Oh well. It did its intended job: To light a fire under me and make me get to work on it. And I’m still working. I don’t really have any pretty screenshots of anything new, but I’ve just finished planning some extensions to the gameplay (a totally different method of doing the collision detection that’ll be faster, as well as different track cross-sections, like driving inside of a tube). Then I’ll start beefing up the actual graphics engine proper. It’ll be nice to get some actual environments around those tracks! Sound complicated? It is! 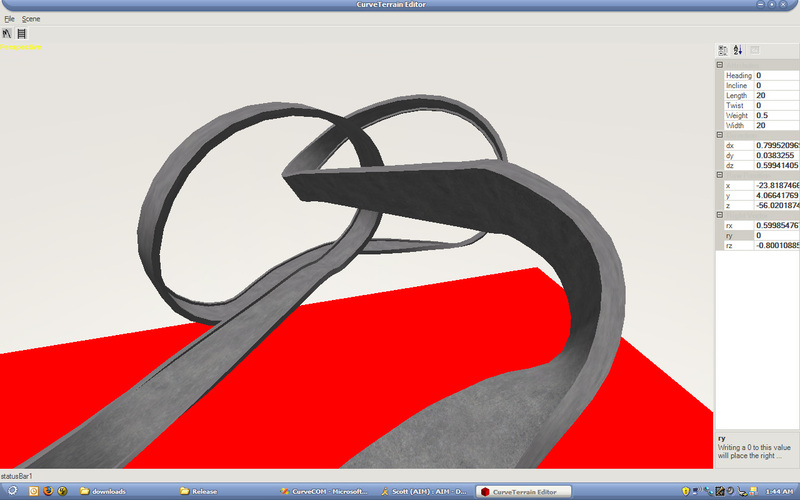 But it’s easier than me coding my own 3D modeller. I tried that once, it didn’t work out so well. Anyway, the AI is coming along…slowly. I’ve stopped developing it until after the collision detection rewrite. 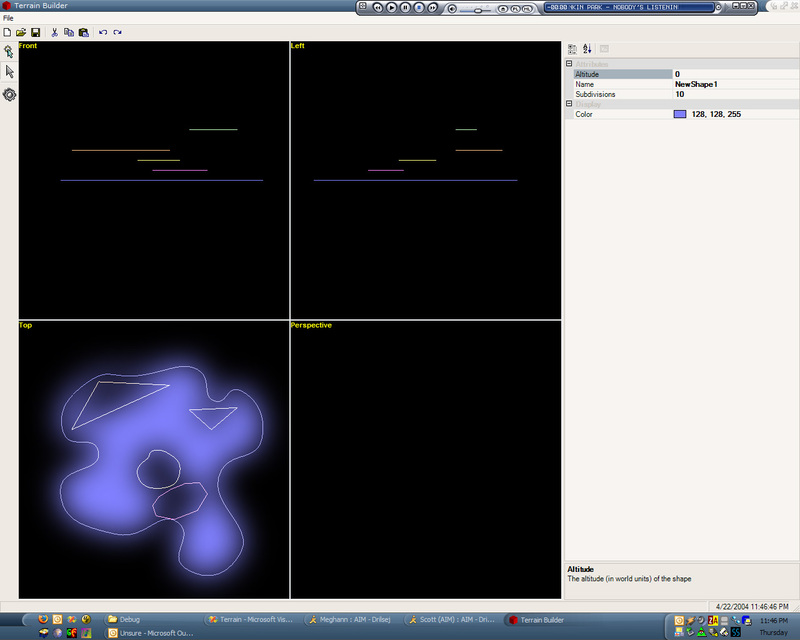 This is still the most progress I’ve made on a game in my spare-time programming efforts. Ever. I’m happy with it! Finally! It took longer than expected (I had some issues with the collision detection), but I finally have the driving code working. That means, I can finally drive around these crazy tracks. As expected, because the tracks that I have were created before I even knew how the cars would handle or anything, not all of the turns/curves/loops are as forgiving as I’d like. Because the car is eventually going to be hovering, the driving control doesn’t have to be as accurate to real life as it would if the car had wheels. So I added some dampening to the sideways motion (Essentially lateral friction to keep the car from moving sideways, unless it’s skidding), but didn’t have to do a full-on friction model. Plus, the car has a force-field (or whatever they will call those things in the future), so the walls actually bounce the car more like a pinball bumper than in a realistic fashion (the force field applies some bounce force). Anyway, now that I have the cars driving, it’s time for the next huge step: Driver AI. Note that I have absolutely no idea at all how to write an AI to drive around my loopy sorts of courses. Time to do some research! 2005.08.21 - Up, Up, and Away! Well, my home computer’s hooked up, my Internet was just turned on, and the slate is clean. Let’s see what the Iron Dev can dish out. Kinda lame, but it was a good test. Each chunk was LODified by using a Binary Triangle Tree, which was a great simplification method, though I did eventually switch to using progressive meshing (though leaving the edges in-tact…not the greatest LOD scheme ever). It was then that I had a vision. Well, not so much a vision, but an idea. Well, not even an idea. More of a thought. Cliffs! That’s right, cliffs. And caves. 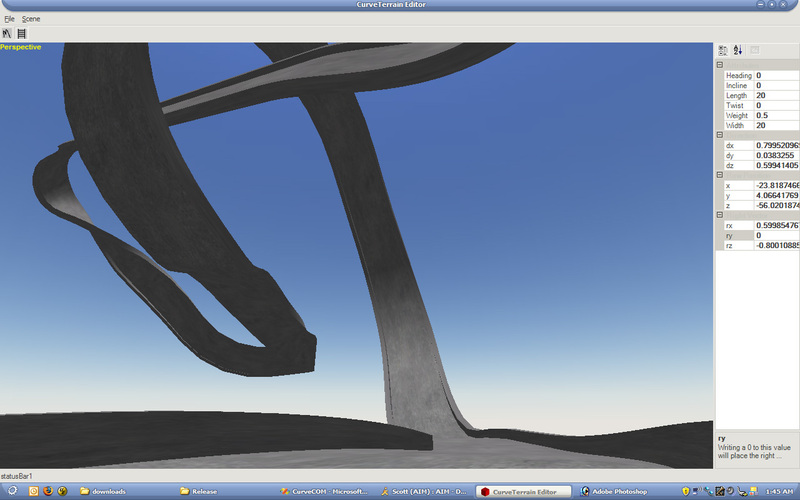 Those were two things that I would love to have, but they’re impossible with a straight-up heightfield renderer. 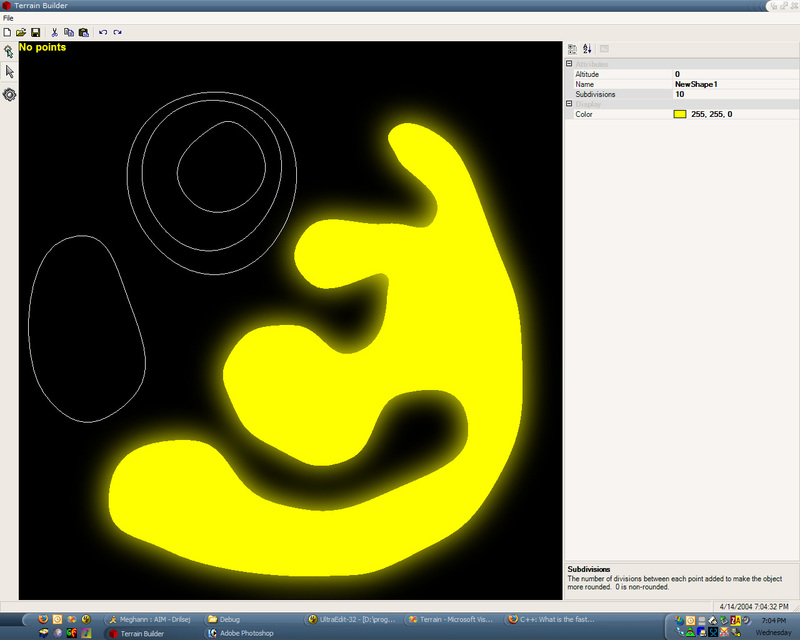 So I set my tired code aside, and began my next crazy scheme. In this system, each shape could be drawn, and given a height value. The editor would fill in the drawn shapes with polygons, connecting them to the other inner shapes (and outer shapes), adding slopes when asked (or making a given shape a plateau). Sound crazy? It was. I coded it for about three months, working on logic to triangulate a complex polygon (overlapping not allowed) which contains children (which are holes in the parent polygon). 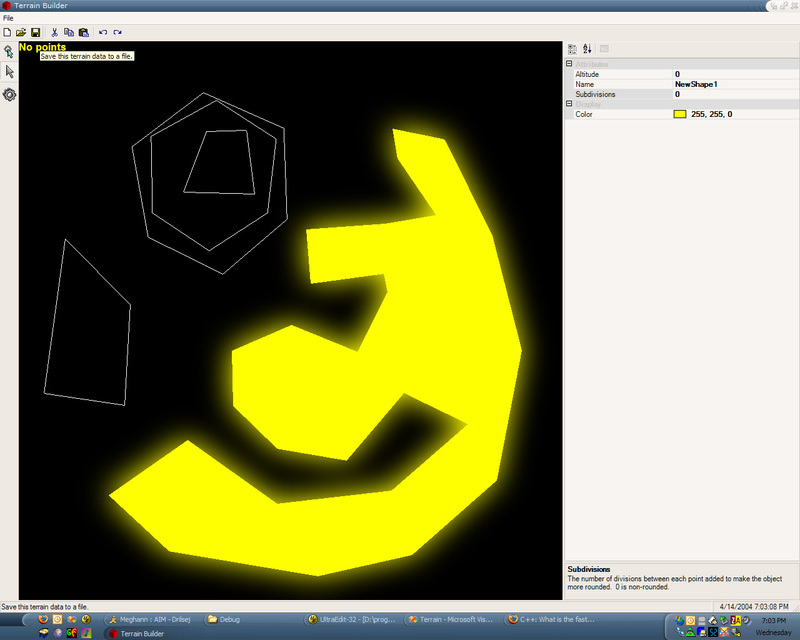 Then I worked on smoothing the polygons by adding curves (see the first two screenshots for a comparison). Each edge was essentially a bezier curve, where the middle two control points were placed based on the angle of the connection to the next/previous line segments. Now, right about now, you may be thinking to yourself: “How does this solve the problem of caves? How did you handle the LOD switching? Isn’t this a lot of work? What’s the meaning of life?” To answer your questions, in order: It doesn’t, I didn’t, Way too much, and free beer. This particular concoction was way too complex, and not near enough to what I wanted. So it, too, was scrapped. There were cracks between the patches, due to floating-point rounding errors. This method worked well, but there were issues with locking/unlocking the buffer. Also, 800 patches meant 800 DrawPrimitive calls, which is, how you say, lame. Thus, I rebuilt the cache algorithm (Yes, I have the technology) to cache items into a set of smaller vertex buffers (that I called “slices”), which were each bound to a specific material (i.e. grass, etc). Thus, they could be batched up better. Soon, 800 patches meant only about 30 draw primitive calls. Which was way better, but there was still a problem. With great caching comes great framerate instability. Since the caching algorithm would sometimes not have to do anything, but sometimes it would have to cache a lot of patches, the framerate became very unstable. Even though it was running faster than 100 fps almost the entire time, it was still highly visible stuttering (especially when I fillrate-limited it a bit). 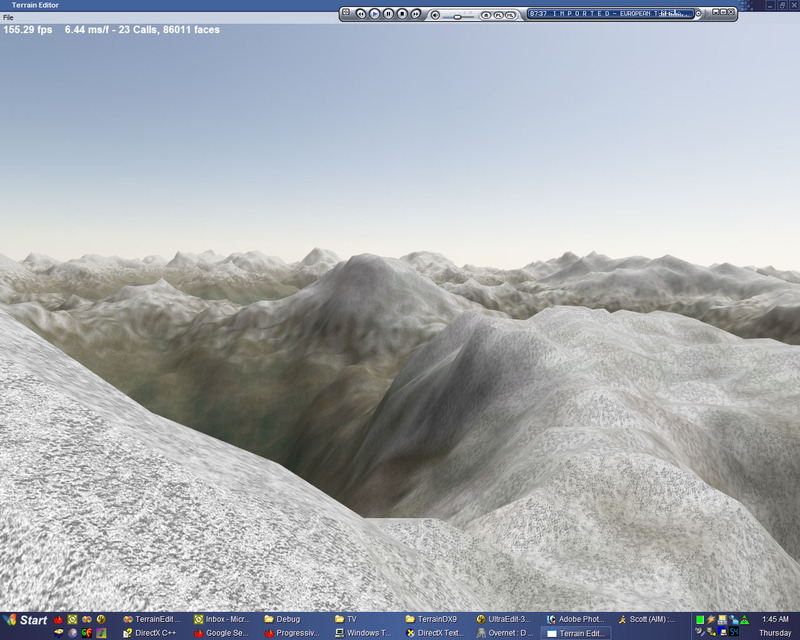 Plus, there became the question of how to actually MODEL such a terrain (I was going to have to write a super-complicated terrain editor). So I wavered. It seemed that there were many, many problems with this implementation and that, while it’s definitely cool, I don’t know that I’m going to be able to do what I want within my newly-created timeframe. So I decided to set this method aside as well, and move on. And that brings us to now. 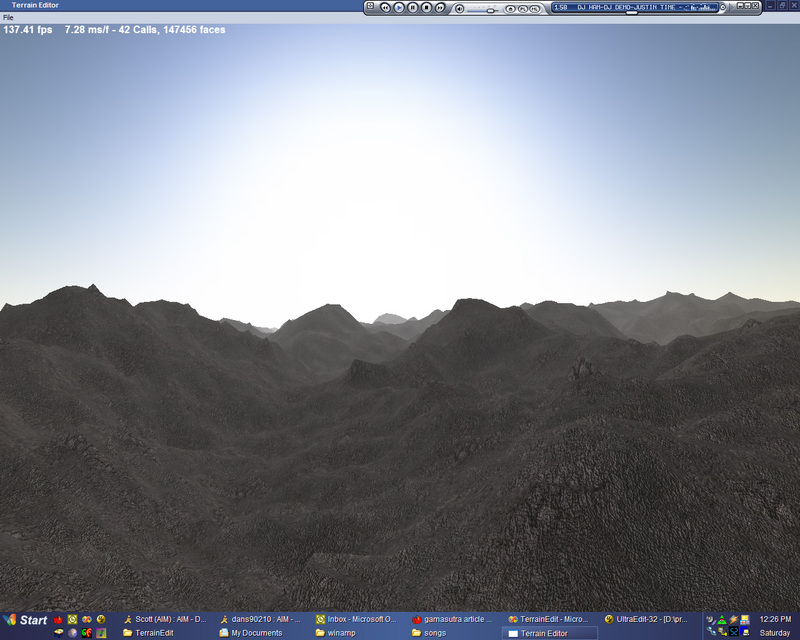 I’ve decided that I’m going to use a simple mesh format for the terrain, though with LOD data built into it. That way, I can use an existing modeling program (I’m looking at you, Blender) to do the modeling, build some simple texture/material/atmosphere editing utilities (or one texture/material/atmosphere editing utility), and just use that. Break it up into LOD-able chunks, and I think I have a winner! Which are fairly representative of the types of tracks I’m aiming to have. Alright, class, that’s the end of your history lesson for today. Up next: New developments in code! 2005.08.18 - This journal will self-destruct in 2.5 months. Okay. I’ve set my deadline. The plans are in place. It’s now a matter of getting it done. A futuristic racing game. Similar to F-Zero. No weapons, no powerups, just racing. But I want it done by the end of October. Impossible, you say? Probably. But I’ve gotta try. And trying is the first step towards failure. Or something. I’m doing the whole thing myself. No artists, no musicians, no sound people, no budget. But I’m picky, so it still has to look good. I’m not very good at programming physics or AI, so I’ll have to brush up on those before I’m done. Textures will probably be mostly digital camera pictures edited to tile. Okay…that’s good enough for now, I think. This journal has helped me get a grasp on exactly how much I have to do. I definitely have my work cut out for me. Side note: I don’t have internet access at home for the next few days, so updates will be less exciting than I would like for the next little bit.